POWER company AGL has committed to building a 252 megawatt gas-fired power station somewhere “near Newcastle” as part of its plan for life after Liddell shuts at Muswellbrook in 2022. Chief executive Andy Vesey will be at an AGL facility at Tomago on Friday to publicly announce the decision, which was released late yesterday to the stock exchange. Although AGL is yet to formally commit to a site, the Newcastle Herald understands that the company is looking at a shortlist of three possible sites within a few kilometres of each other, in and around Tomago. Macquarie Generation, which AGL purchased from the NSW government for $1.5 billion in 2014, gained approval for a similarly sized gas-fired power station at Tomago in 2003. The approval may have lapsed, but that plant had a proposed first stage of 260 megawatts. It was aimed at easing power shortages at the time caused by a rapid uptake of air-conditioners. 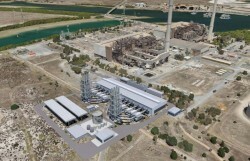 Although the new plant will not fully replace Liddell, which can generate 2000 megawatts, AGL is promoting it as part of a broader generation plan submitted to the federal government and the Australian Energy Market Operator in December. “AGL is committed to supporting the orderly transition of Australia’s electricity generation capacity to modern, clean and reliable energy supply,” Mr Vesey said. Mr Vesey said the power station would be built near AGL’s Tomago gas facility, off Old Punt Road, which was approved by the NSW government in 2012. It and an AGL substation are close to Tomago Aluminium. He said AGL had now committed to the first stage of its NSW generation plan, which included a 100-megawatt upgrade of Bayswater power station, a solar off-take to provide 300 megawatts, a “demand response” program that would encourage customers to use the equivalent of 20 megawatts less power, and the Tomago gas plant. He said they were still looking at stage two, which included another 500 megawatts of gas. With all of the stage one elements in place, Mr Vesey said there was enough power to “address the capacity shortfall that may occur as a result of Liddell closing”.